Editor’s note: This is one of several features from our 2018 Technology Guide, which includes our annual Retail Technology Buyer’s Guide. Download the full guide here. Technology solutions are increasingly critical in the brave new world of twenty-first century off-premise retailing. Historically, alcohol retailing was exclusively onsite and in-person, but that’s changing. “Consumers expect to be able to shop omnichannel, to buy liquor from phones and laptops, because they’re doing that in every other aspect of their life,” reports Bryan Goodwin, senior vice president of Drizly. Technology partnerships are crucial to meeting today’s customer demands and competitive challenges, but it’s a crowded and complicated arena. How can a busy retailer sift through all the options and choose a solution that saves time and headaches instead of compounding them? We spoke to insiders on both sides of these partnerships for their insights. Technology partnerships are crucial to meeting today’s customer demands and competitive challenges, but it’s a crowded and complicated arena. BevDeals, launched in June 2018, is an online marketing and sales platform which streamlines the relationship between suppliers, distributors, retailers and restaurants. Founder Bjoern Lanwer explains that all three tiers benefit from a single central platform. Shops and restaurants access deals from multiple distributors, they can place all their orders simultaneously 24-7 and they can chat online with reps.
“The platform puts the power of time back in their pockets,” Lanwer says. “They always see the best deals, so they can make an educated decision, instead of under pressure when the reps come in. They can plan much better.” Centralized data also improves cash analysis. Breinify is an engine solution that analyzes consumer data via AI (artificial intelligence) and machine learning. “We predict what their customers will be interested in, and we act on it by sending individualized email, SMS or push notifications on an app,” says CEO Diane Keng. Messages are further leveraged by integrating weather, local sports, holidays and events such as World Whiskey Day. 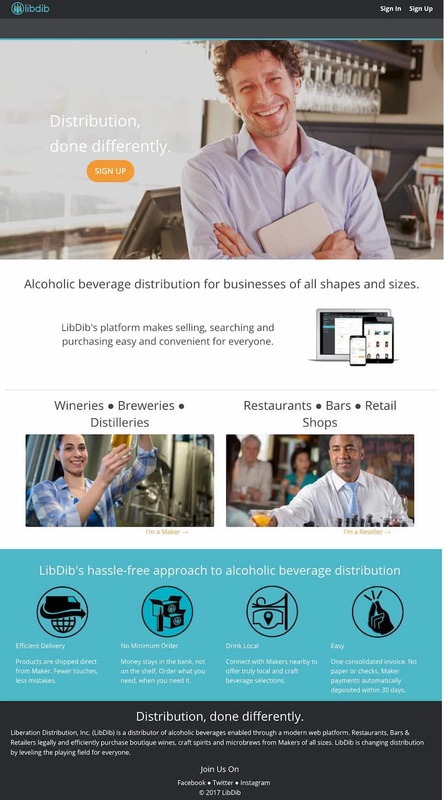 LibDib was launched in 2017 to give small craft beverage makers a more level playing field. “We’re providing access to a marketplace where typically the wholesaler is gatekeeper,” says Cheryl Durzy, CEO and founder. Wholesalers often reject small makers due to low volume, but “my belief is consumers are evolving. They seek authenticity and smaller, local, family-owned producers.” The rich platform has content contributed by the maker, and enables consumers to contact makers directly. Retailers register for free accounts and can still use other distributors. After 16 years in the credit card processing business, Merchant Preferred saw a need and filled it in 2017. Merchant Preferred Zero makes it seamless for stores to effectively offer a cash discount, thereby “immediately avoiding anywhere from $25K to $100K in annual fees for a small- to medium-sized store,” says co-owner Todd Odasz. For a flat monthly fee, the company provides signage and reporting, and maintain PCI compliance. Drizly is “the world’s largest alcohol marketplace,” Goodwin says. For stores, “we are their seamless turnkey ecommerce solution. We’ve brought retailers from initial conversation to live on our platform in as little as one day. They get higher basket sizes and access to more customers and to our tools such as data insights and online inventory,” he adds. With such a wealth of digital solutions to choose from, how can you make the right choice when investing in a tech partnership? With such a wealth of digital solutions to choose from, how can you make the right choice when investing in a tech partnership? We asked retailers from around the country to weigh in. Tamara Pattison, chief marketing and information officer at Bev Mo, advises to “start your journey with the problem you’re trying to solve, then look at how other retailers or people in adjacent industries are approaching that problem, what technical or other tools are they using, to narrow down the potential group of vendors or technologies to investigate. We come at it from a solution-oriented approach. Ask what customer or associate problem you’re trying to solve.” Bev Mo is focusing on AI and machine learning for both customer-facing and back office applications. Andrew Byer, manager of Tri-State Liquors in Claymont, Delaware agrees. “Go out and talk to other retailers.” He affirms that “ecommerce is way to go. People like to be on their phones, they got used to ordering with one click. “Tri-State has touchscreens on the shelves with recipes, in-store specials and event announcements, and finds great value in list segmentation and Google Analytics. Brian Jobin, general manager at Tin Woodman’s Flask in Chittenango, New York, emphasizes that retailers need to look at what fits their environment, their shop, their demographic. “Tech is not embraced by everyone,” he says. Tin Woodman’s has interactive kiosks. “Guests simply scan the bottle and get info, pricing, tasting notes and a little bit of history,” he says. “It’s a valuable addition to guest experience, especially if they don’t have the wine/spirits knowledge.” He utilizes the Wine Ring application, enabling patrons to create a database of wines they’ve tasted. Based on their likes and dislikes, WineRing suggests options. On the whole, he believes “those tools have been very helpful in creating a more educated guest, who feels more comfortable with their purchases and understands more about the products.” Overall, retailers value streamlined technology which simplifies their workday. They recognize that competing in the virtual marketplace is essential, and that segmented, personalized, marketing efforts are key to growing customer loyalty. Annelise Kelly is a freelance writer based in Portland, Oregon. Her passions in writing and life are food, beverages, travel and sustainability. Custom publications, trade magazines and content marketing are her specialties. See more of her writing at annelisekelly.com.